Last week, Prince Johann Georg of Hohenzollern, husband of Princess Birgitta of Sweden, died in Munich at the age of 83. (Coincidentally, the newest Swedish prince, Oscar, was born the same day -- definitely a "circle of life" moment for the Bernadottes.) Today, we're looking at two of the most public and most bejeweled days of the late prince's life: the two wedding ceremonies that united him with Princess Birgitta, sister of the current king of Sweden. Johann Georg, who was called "Hansi" by friends and family, met Birgitta at a cocktail party in Germany in the late 1950s. In December of 1960, they announced their engagement to the public. The couple followed Swedish tradition and presented each other with engagement rings: plain gold bands, both worn on the ring finger of their left hands. Because the couple were from different countries and different religions, two separate weddings were held. 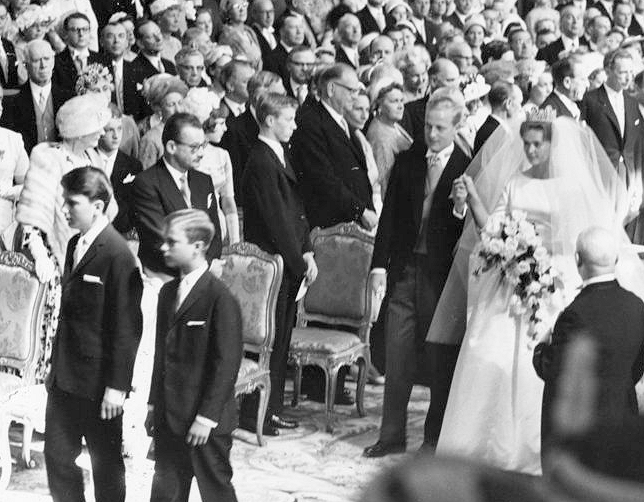 The civil marriage was celebrated in the Hall of State at the Royal Palace in Stockholm on May 25, 1961. 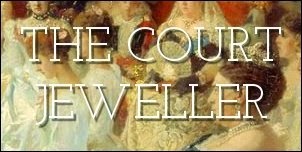 The bride wore the Cameo Tiara that has since been worn by several Bernadotte brides, including Queen Silvia and Crown Princess Victoria. The New York Times noted that the bride and groom "exchanged vows, but not rings" at the civil ceremony, which was performed by the mayor of Stockholm. The ceremony, witnessed by 750 guests, lasted a quick three minutes. The bridal party at the civil wedding ceremony consisted of the bride's youngest sister, Princess Christina of Sweden; her cousin, Princess Benedikte of Denmark; her brother, Prince Carl Gustaf (now King Carl XVI Gustaf of Sweden); and her cousin, Count Michael Bernadotte af Wisborg. Birgitta converted to Catholicism on her marriage, and she and Johann Georg were married in a second religious ceremony in his native Germany. The Catholic ceremony was celebrated on May 30 at the Church of St. John in Sigmaringen, the location of the Hohenzollern family's schloss. The ceremony was conducted by Dr. Benedikt Reetz, the abbot of a nearby monastery. Two hundred fifty guests attended the ceremony, including Prince Louis Ferdinand of Prussia, then the pretender to the German and Prussian thrones. Birgitta was given away by her uncle, Prince Bertil of Sweden. The Times of London reported that Prince Johann Georg was escorted into the church by his new mother-in-law, Princess Sibylla of Sweden (who was herself born a German princess), and Duke Alexander of Wurttemberg. Princess Birgitta donned a different tiara for the religious wedding: the diamond circlet with clover-shaped toppers from the Hohenzollern collection. (Both of Birgitta's wedding tiaras fit nicely into the tradition of Swedish bridal crowns.) You can also spot a traditional sprig of myrtle peeking out of the edge of the tiara. After the wedding ceremony had ended, the couple rode through the streets of Sigmaringen in an open carriage, finally arriving at Schloss Sigmaringen for a reception. Johann Georg and Birgitta had three children; they eventually decided to live separately, though they never divorced. Both were frequent guests at major Swedish family events, including the 2010 wedding of Crown Princess Victoria.